With the time change comes a change in sunlight. 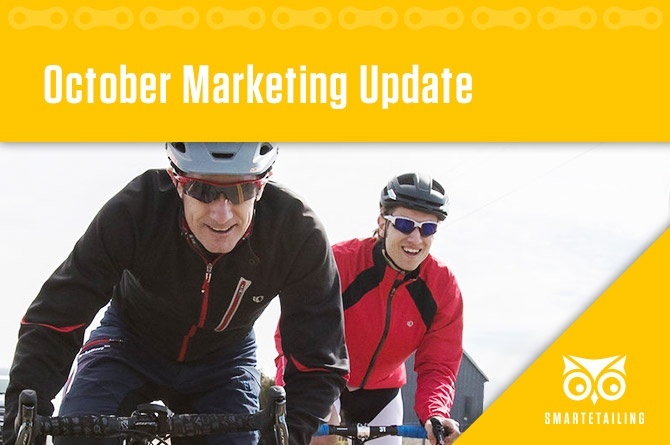 That's why we've developed some marketing materials to help you help your customers keep riding. Encourage your customers to get out and explore their neighborhood while the weather is perfect for long casual rides. We have materials in the library for these messages and more like fat bikes and tune-ups. These marketing materials are designed to drive sales online and in-store. Don't see marketing materials for the product categories you want to promote? Reach out our support team, or your marketing account representative, and they would love to help you get what you need to increase sales online and in store. With the time change comes a change in the amount of daylight riding time. Help your customers out by pointing them toward the newest innovations and models of cycling lights. Your customers have been riding hard all summer. Get them in the door for a tune-up to help extend their riding season into the autumn months. Showcase fall apparel in the store to maximize their visit. Showcase the perfect bikes for autumn and winter riding. These bikes go anywhere, anytime no matter the weather. Get your customer riding all year long. Sometimes all we need is a slight nudge out the door. Use these marketing materials to encourage your customers to ride more and ride local. This is primarily for building community and encouraging shop loyalty. Celebrate Halloween by showcasing lights and other safety gear for those late night rides. There is also some tie-ins with kids bikes and accessories that can be made in store. These and other marketing assets can be found in your Content Manager Library. Multiple sizes are now available for each highlight, as well as multiple brand options! Import the size that fits your rotator and link to your new page. We even have solutions for those using a responsive template.